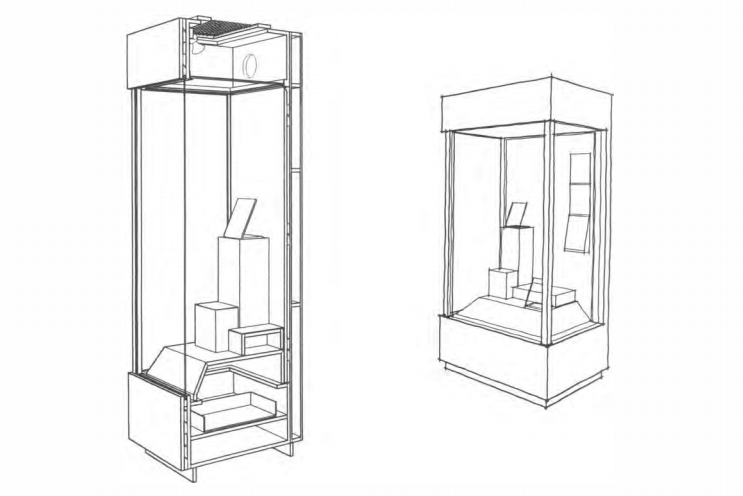 Guidelines for museum exhibit cases including conservation, fabrication, and accessibility for people with disabilities. Specify only laminated safety glass. Standard safety glass contains two inner films or plastic sheets of plastic that create a UV barrier as well as being very secure through break resistance. This is known as P2A or meets the UL972(12), CPSC16CFR1201 or ANSIZ97.1 standard. Standard thicknesses include 8.76mm, 10.76mm and 12.76mm. Anti-reflective coatings- Glass can be coated at the point of manufacture with an antireflective coating that reduces glare by up to 98%. MEDEX, Medite II and other ZF (zero formaldehyde) MDF products- These are the most often specified case materials for museum work. NPS still specifies these products but the Smithsonian no longer considers them acceptable (NARA does not consider ANY wood products acceptable). Consider at the least a liquid applied type membrane barrier such as waterborne polyurethanes or two-part epoxy and at best a physical barrier such as metal laminate foils (marvel seal), HPL laminates (Formica) or actual metal such as sheet aluminum. Water based acrylic latex coating including paint offer no protections. Appleply- Appleply by States Industries is now the wood based material that the Smithsonian recommends. This material STILL off gasses formaldehyde, but at a lower rate than the ZF MDF products. This product still needs a liquid membrane or physical barrier applied to the surface. Solid woods should be avoided due to their expansion and contraction issues however; woods that have a low resin and acid content are the best choices for construction techniques if you need to use them. Consider birch or poplar and avoid high resinous or acid woods like oak and walnut. NARA no longer consider any wood products acceptable for case construction. Materials such as welded frames, powder coated steel and aluminum and stainless steel are the most popular materials used in these case types. Mark is Managing Partner of Museum Planning, LLC, a museum planning and exhibition project management firm of interactive educational environments for Science Centers, Children's Museums and Natural History Museums. You can reach Mark at mark@walhimer.com.